Buy the Farm . . . Share: The Devil is in the Details . . . and in the Sauce! The Devil is in the Details . . . and in the Sauce! We still have two giant bags of assorted apples and pears from Boyer's Orchard and Cider Mill in Monkton, Vermont. They sit on our counter and dare us to do something with them before we are forced to merge them into some unholy pear-applesauce hybrid as a last ditch effort to salvage them. So far we have only worked our way partially through them. Ah, the joys of going apple picking. 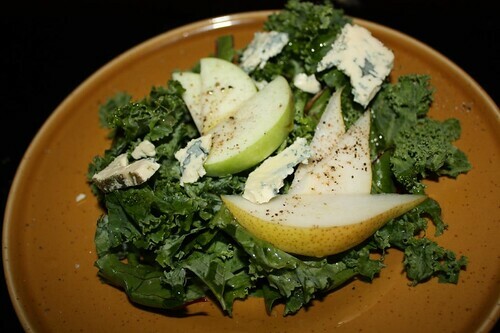 We did, however, slice up some of the Bartlett pear (now beautifully ripened and Macintosh apple to go with this salad of kale, endive, and beet greens with some of the Blue D'auvergne. 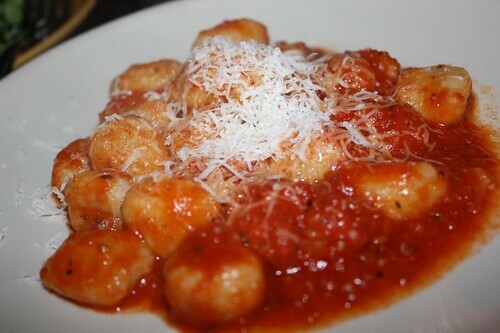 For the main course this evening I made some gnocchi with fra diavolo sauce. Fra diavolo is Italian for "Brother Devil." Like just about every Italian dish you find in America this is not actually Italian, but rather and Italian-American creation. It's a spicy tomato sauce made with white wine and chili peppers (or red pepper flakes). Growing up as part of an Italian-American family I really didn't realize that just about everything we made was not actually Italian but rather some strange Americanized dish that was loosely (or not at all) based on a dish from Italy. It's too bad because this food is really, really good. While we never had fra diavolo growing up this pretty much fits in right in line with the good home-cooked Italian food we had growing up without crossing the line over into the Olive Garden "Italian" food that is prevalent particularly in the last few decades. Not that I have anything against Olive Garden, I just don't know what the heck it is. As my Italian grandmother would say, "That's a-one a-spicy brother devil!" 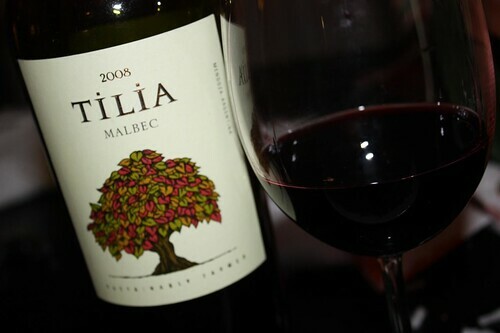 As an accompaniment I opened a glass of the classic Italian wine: Malbec! Malbec grapes are fantastic for wine-making and primarily grown in mountains of the Italian Andes. That's why it has hints of black pepper, tobacco, and eggplant parmesan.